Now is better than ever! 16 November 2017, Harisar Ashram, Kila Raipur: Myths are like poetry that helps make sense of the world around us, and our very place in it. But, They.Are.Myths! Why hold on to that when we are bound to embrace the reality, even if it stings us. We ask for ‘forever’, but what we fail to understand is that forever is composed of now-s. Yes, right here, right now! And so, once again, aspirants had gathered under one roof on the occasion of Sankranti, seeking some more clarification on what’s and how’s of this inner divine journey. 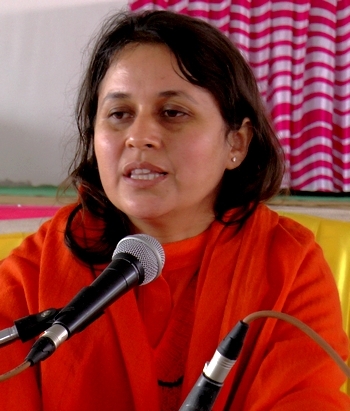 And like always, Sadhvi Ji addressed the gathering with her know-hows, filling the gaps all the way up there! While we are in a train, we do not indulge ourselves in a) making everlasting relations with people travelling along and, b) whatsoever attachments with respective coach or berth, for that matter. Although it might sound unperceivable but fact is that exactly same is true when it comes to our cycle of life and death in this materialistic, and evidently transient world. Whole fuss is about accumulating what wouldn’t go along with us. When death comes all we get to leave is like a beggar dropping even the very clothes we would have put on. Half-truth: If we engross ourselves in performing service (sewa) and practicing Guru-mantra (simran), i.e. in sadhna our source of earning/household chores would take a back seat. Truth: Yes they would take a back seat. But, not because we would not be able to or get time to perform them. But because they will get adjusted just like how water makes its way through a jug filled of stones. So, with a positive vision and a receptive frame of mind let’s get it done with crying or boasting over the uncontainable circumstances. Life is too short to overweigh ourselves with long-held-grudges. Lets move on! Now is better than ever!